Inspired by New England waters and international flavor profiles, Norwalk Now celebrates summertime with vibrant seafood dishes befitting that of a thriving coastal community. From raw bar favorites laced with hot sauce to butter-vs-mayo lobster roll wars, Norwalk restaurants embrace the season with a variety of classic, innovative, and over-the-top seafood dishes that add to our summer enjoyment. Kane Xu, the owner of Beach House SoNo, pulls from his extensive Asian restaurant experience in creating the restaurant’s popular Salmon Summer Roll. Fresh salmon sashimi, cucumber, avocado, and red tobiko are wrapped in rice paper, providing a colorful stain glass window effect to this light and refreshing flavor bundle topped with spicy mayo. Low-country cuisine is in play at Peaches Southern Pub & Juke Joint as illustrated by the mammoth bowl of Bayou Mussels steamed in a fragrant Jambalaya broth with Andouille, peppers, onion, garlic, and shrimp broth served with country toast for soaking up all of these rich flavors. There’s even bottomless bowls of mussels every Wednesday night! Our House not only has that dive bar thing down pat, they conquered the food equation in the form Urban Taqo Company, the bar’s indoor taco truck which so brilliantly fills the bellies of spirited imbibers. One of our faves includes the VooDoo Child Taco filled with gumbo shrimp, andouille sausage, tomato, peppers, onions, and season seasoned rice, wrapped in griddle-warmed flour tortillas. 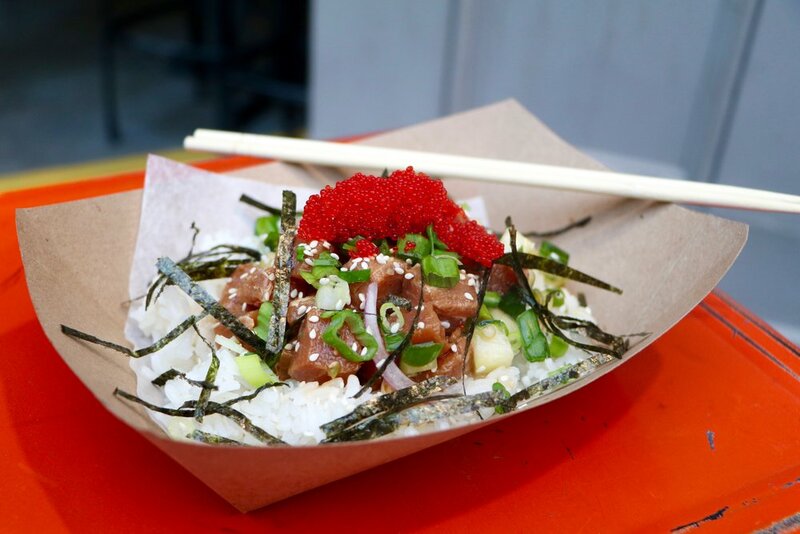 El Segundo continues to take diners on a virtual trip around the world with their Hawaiian inspired Tuna Poke Bowl filled with marinated ahi tuna, white rice, green onions, seaweed, cucumber, soy sauce, and ikura. Grab your chopsticks and enjoy this island delicacy at the eatery’s outdoor tiki bar with their signature Singapore Sling cocktail. Wall Street’s charming trattoria, Bar Sugo, known for their wood-fired pizza, handmade pasta, and those insanely good meatballs, features an Italian specialty, Grilled Whole Branzino. This moist, flaky white fish is stuffed with rosemary and lemon and served crispy skin and all, topped with salsa verde (anchovies, capers, herbs, and lemon juice), grilled garlic scapes, French baby fingerling potatoes, and grilled lemon. SoNo’s newest addition, Public Wine Bar, is a contemporary Mediterranean inspired restaurant with a large selection of seafood dishes. A true menu highlight is the Seafood Risotto overflowing with fresh lobster meat, shrimp, and sea scallops, all of which come together over al dente Arborio rice and a rich truffle champagne lobster sauce. Best of the Best Roasted Shrimp is a seasonal offering at The Spread, known for an always changing menu with dishes that you won’t see duplicated anywhere in the county. 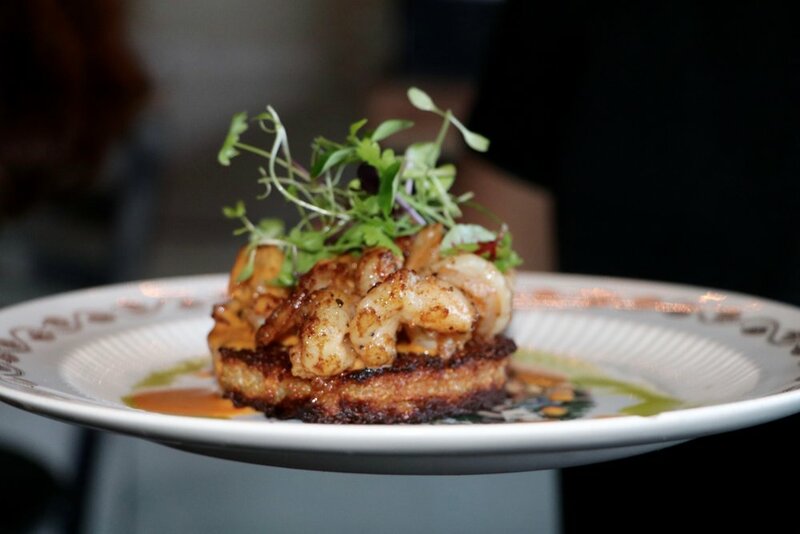 Chef Carlos Baez tops a crispy caramelized onion quinoa cake with spicy dusted shrimp and house-made chorizo sauce. Saltwater Restaurant & Bar stays true to its name with a massive seafood menu which begins at the icy raw bar display. From chowder to crab cakes, this nautically themed location screams summer! Enjoy their Pan Seared Tuna encrusted with black and white sesame seeds and served with fingerling potatoes, braised bok choy, wasabi, and soy sauce. A South Norwalk anchor at the corner of Washington and Water Streets, Washington Prime’s land and sea menu made its mark within the local restaurant scene with prime steaks, an eclectic small plates menu, oysters at happy hour, and seafood every which way. A Washington Prime favorite is their Grilled Octopus served with crispy duck fat potatoes, pepper emulsion, pickled onions, and cashews. On the other side of the pond, in this case, Main Street SoNo, O’Neill’s Irish Pub is on point with their Traditional Fish & Chips, perfectly fried ale battered scrod, served with malt vinegar and tartar sauce and a side of crispy fries. A pub staple, check out O’Neill’s on Fridays for their famous fish & chips lunch and dinner specials. Cask Republic, Norwalk’s premier destination for craft beer, premium spirits, and quality tavern fare features American comfort foods with a nod to global influences. Culinary Director Carl Carrion prepares the restaurant’s Shrimp & Grits with grilled tiger shrimp atop decadent Cotija cheese grits with a bold Andouille sausage vinaigrette.